OPRAH ALWAYS HAS REAL, INSPIRATIONAL WOMEN ON HER SHOW. I NOMINATE THESE LADIES!! 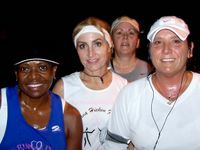 UP, IN THE DARK FOR A GREAT CAUSE-RUN ON!